Justice In Islam! « www.majidall.com – Being who you are and saying what you really feel! When I was studying in Secondary School in Tanzania in the early 1960s – they were introducing Socialism as a Compulsory Subject for all the students. If you failed in the subject you just did not get your Secondary School Leaving Certificate! It was as simple as that! In one of the topics they were preaching of how Law and Order was being broken up by ‘the enemies of The State’ by mocking and making fun (trifling!) the State Institutions – especially those involved in keeping ‘the Safety and the Security’ of The State apparatus! Once ‘they’ have done that – that is the The Enemies – the rest becomes easy! In one of the famous phrases by Mao – The then China Communist Leader – was ‘Peace comes from the barrel of the gun’! It scared me to bits and pieces! They even talked about one Being The Judge, Jury and Executioner Stuff etc! As we watch around us things going wrong all around us it is important that we remain ever vigilant and alert of Protecting and Preserving our beloved Nation. It is noted that we Omanis are loyal, trusting respecting and welcoming peoples – and some may even label us as being ‘weak and docile’ for that matter! 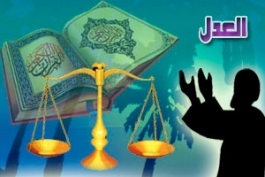 I feel, therefore, that it is important to REMIND OURSELVES of sense of Fairness, Justice in Islam – lest we deviate – whether inadvertently or by default even. My Last Posting! Let Things Go!